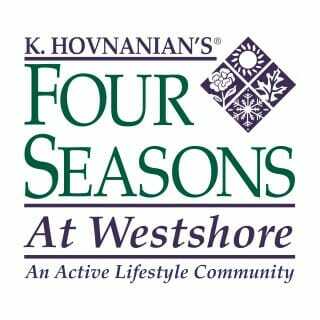 K. Hovnanian’s® Four Seasons at Westshore is an active lifestyle community that offers many clubs, activities and resort-style amenities. Here, neighbors become treasured friends. The centerpiece of the community is The Lodge, a fabulous recreation center that is exclusive to residents. Enjoy activities such as bocce, tennis, billiards, swimming or just relax by the outdoor fireplace. The Lodge boasts clubs for nearly every interest including cards, arts and crafts and so much more. The lakes within the community provide a serene backdrop for a picnic or an evening stroll. Home designs are all single-story residence and range from approximately 1,510 square feet to 2,731 square feet. Each home has an open entertaining area and luxurious master suite. Each home features 2-3 bedrooms, up to 2.5 bathrooms and ample storage throughout. Some homes feature formal dining rooms for entertaining, dens for a craft room or office and built-in desks. Visit today to find your ideal new home.